Over the past few weeks, I have been learning about the importance of two digital literacies, Code Breaking and Meaning Making. Code Breaking “involves the ability both to decipher and produce (encode) texts at a practical level” (coombs). However, this skill typically has related to one’s ability to create and interpret forms of literature (coombs). The “elements” of code-breaking “do not transfer directly to the digital but they do have their equivalents” (coombs). This description of Code Breaking, as it applies to non-digital contexts, has assisted me in understanding how it can be applied to a digital context and why it is important. Unlike literature that exists outside of the digital world, digital contexts provide texts that are “predominantly multi-modal” and have “new operations for creating, navigating and interacting” (Coombs). Therefore, “the resource learners need for decoding and making meaning from multi-modal texts have an increased scope” (coombs). There are a few characteristics of decoding such as, “navigation”, “conventions,” “operations,” “stylistics,” and “modalities” (Coombs). Each of these characteristics is important when an individual is decoding a digital context. It is important for “learners… to develop familiarity with the conventions and structures of digital media, sensitivity to the different modes at work within digital artefacts and confident use of the operational frameworks within they exist” (coombs). the development of these skills is pivotal for students because in our world children need to have the ability to understand and create their own understanding of digital contexts. Making meaning is also a pivotal digital literacy. Making meaning means that the student’s power has been acknowledged, allowing them to partake “in the construction of a text” (coombs). It is a “reflective process” where “the content, style, and purpose of the text” relates to “prior experience, knowledge and responses of the reader”(coombs). Making meaning requires an individual to have “both understanding and interpretation” (coombs). These two critical digital literacies impacted my work this week because they made me think of all the factors at play while I was learning how to use new applications. I thought about how I used prior knowledge to understand how these applications worked and implemented my decoding abilities. Through my creative makes, I can further show how I needed to use these critical digital literacies in order to create these makes I have shown below. Canva – Follow this link to go to the Canva website. On this website, you can make a variety of visual aids. I made a Poster style checklist for children who are learning to write stories. I have never worked with Canva before creating this poster. While I did this activity I had to do some code breaking and making meaning to develop my understanding of how the application worked. I used my previous knowledge from navigating other applications which are similar. Additionally, my “grasp of common functional procedures” gave me “confidence [when] engaging with new tools,” like Canva. My knowledge of operations was critical for me to have success with this application. If I did not have an understanding of operations the decoding would not have been as easy. While working with this application to create this poster I was able to “make connections” between my” new and existing knowledge,” which is a crucial characteristic of making meaning. Doing this exercise helped me to understand why it is important for teachers to teach their students how to develop a wide range of critical digital literacies. If I did not have any experience with technology I would have had a difficult time figuring out how Canva worked. I believe that my extensive knowledge of Adobe Photoshop was helpful while using this because that existing program knowledge helped me to move images and text within the program. As I was doing research this week about Code Breaking and Making Meaning I came across an awesome resource. I found Eleni Kyritsis blog. She “is the Leader of Digital Learning and Innovation” working as an elementary “Teacher [in] Melbourne, Australia” (Kyritsis). Her blog features an excellent post all about Spheros in the classroom. This blog post showcases several different lessons Spheros can be used for. 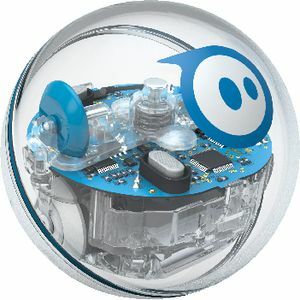 Right now you may be wondering; “What are Spheros?” Spheros are small spherical robots that teach children how to code and program. Children can use Bluetooth to connect their Sphero to an iPad. On the iPad, the child can create code for the robot to follow. Kyristsis post about Spheros shows many examples of how this technology can be integrated into all types of lessons. In the lessons, she presents I saw many opportunities that would push students to develop both the digital literacies of code breaking and making meaning. For example, one of the lessons proposed that students can use Spheros to help develop their understanding of angles. In this lesson the teacher has the students calculate and draw angles, create them with tape on the floor, and program their Sphero to follow the angles. When doing this project children will need to enact their decoding skills because their preexisting knowledge will help them to navigate programming with the iPad. Many students will have had experience using iPads at home or in another context, this experience will assist them when they need to understand the operations. Likely, if the student has any experience with Apple products, they would know how to navigate to the app, touch the screen to complete actions, touch and drag the code blocks. These basic skills are important in developing a strong knowledge with a new application. Additionally, I think it is interesting how working with Spheros is a building block for creating base knowledge of programming. This application and technology is an easy introduction for the student to the basics of coding. The experience with Spheros will teach children preexisting knowledge that can serve as a basis for code breaking and making meaning if they go on to do coding in more complex applications and situations. While working for Actua Canada this past summer I taught students how to program Spheros. I saw how the children we able to make meaning and code break, first hand. It took the students a little while to begin to understand how the program worked at first, but slowly used their past experiences, as well as trial and error, to make it work. I noticed that the children who had experience with iPads at home or in school were more successful, or faster, to figure out the program. The speed that the students with different experiences picked this skill up exemplifies how preexisting knowledge plays an important role in helping with making meaning.